when your dog is stressed? Does your Coton de Tulear have dog anxiety? While the breed is in general very easy going and calm, just like any dog, they can experience canine anxiety and various fear phobias. Just like with people, stress not only causes behavioral and emotional issues, it can also cause all kinds of health problems. It’s important to be able to recognize the signs as soon as possible. One of the things I learned from dog trainer, Doggy Dan, is that the key is to learn these clues early so you can prevent your pup from entering what he calls the Red Zone. Once dogs get to that point it is extremely difficult to control their behavior. 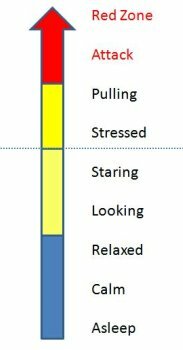 You can gauge from this chart where your dog falls on the anxiety scale and take action at the appropriate time BEFORE it becomes an issue. Dogs that are not trained properly. They need us to be in charge; to lead and guide them so they can feel safe and secure. So, now that you can recognize the symptoms of dog anxiety and understand the causes, you need to learn how to have a calm dog.